Experience complete front end business process solutions for your organization with Web based solutions for Projects, Purchasing, Time Reporting, Help Desk and HR with Tracker Suite Version 5.1 Tracker Suite offers secure, scalable, easy to use, integrated solutions, with configurable workflows, complete reporting, and real time data for an effortless end user experience. 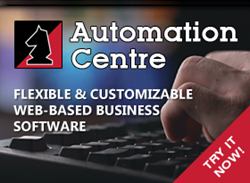 Tracker Suite 5.1 could be the best product ever produced by Automation Centre, says founder, Steven Birchfield. “Tracker Suite 5.1 could be the best product ever produced by Automation Centre” says founder, Steven Birchfield. Tracker Suite now works on more devices, it is easier to use, faster, more secure, and supports the latest web technologies. Major innovations, including, new form design capabilities and a new web based business intelligence engine that allows users to easily drag and drop their own report designs and create drill down graphics. Scalability has been dramatically improved, and this release was tested with tens of millions of records, without a significant reduction in in transaction times. We enhanced our look and feel for user experience. No one really wants to stare at a software screen all day but if you are a knowledge worker, your experience should be as beautiful and artful as it can be and Tracker Suite 5.1 delivers just that. In some areas we made the fonts larger, in other areas we added icons. We introduced some subtle color or shading for elegance, and we have also added subtle pop up helpers to make it smarter. “Security, Accessibility, Elegance, Functionality and Performance” are the words that best describe this release. New Graphical Business Intelligence Designer, with Bubble Charts, Pie Charts, and Bar Graphs available. 25% faster with optional time to load timers that can be enabled to troubleshoot slow networks. Support for all major current internet browsers. New personalization options, drag and drop to create the perfect one touch access to your data. Improved rich content management, with rich text drag and drop attachment, better document formatting, and improved messaging. Meeting scheduler to easily schedule teams and manage meeting agendas and minutes. New form designer and workflow options. Improved work prioritization and resource management. Improved user experiences, including type ahead and more intuitive validation. Security Audit Support, logging user security changes and tracking access history. Support for web farms, load balancing and clusters. As always, customers from previous releases who are current on maintenance have access to the upgrade, and customers may also request information about the Tracker Suite Cloud options available. For more information, please contact: info(at)acentre.com.